Knight began his footballing career as a junior at Burnley, but wasn’t signed as a full professional until after the Second World War in August 1945. He went on to feature in 26 league games for the Turf Moor side, scoring five goals. He moved to Preston North End in December 1948 for £8,000 plus a player in exchange, adding a further seven goals in 39 starts. His next move was to Chesterfield in July 1951, where he played in 35 league games and scored six goals. 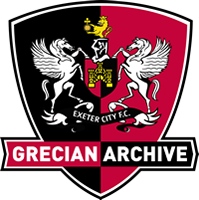 Knight was signed by Exeter City for a fee of £3,000 in August 1952 and he made his debut in a 2-0 home win over Northampton Town, scoring one of the goals. In his first season at St James’ Park, Knight scored four goals in 36 league starts. The following seasons didn’t prove to be so successful as he featured in 20 league matches, scoring twice. On leaving Exeter at the end of the 1953-54 season, Knight signed for Southern league, Bath City. He died in 1996.